Spinach has a high nutritional value and rich in vitamins, iron and calcium. 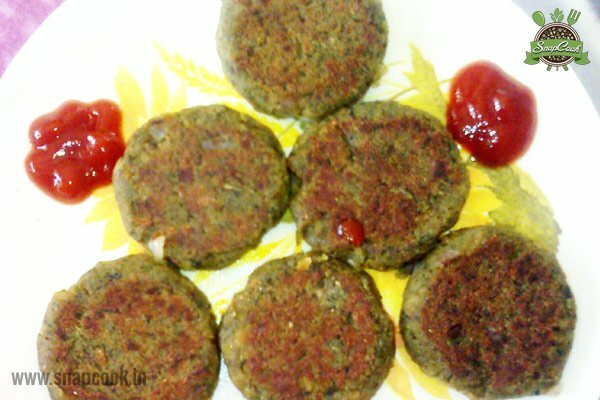 Let us combine the nutritional spinach with some seasonings which comes out as a very healthy and yummy snack. Wash the spinach leaves. Bring it to boil, drain the excess water and put boiled leaves in cold water. Heat oil in a pan, add cumin seeds and let it crackle. Now add chopped onion and saute it till golden brown. Add ginger-garlic paste and saute for another 1 minute. Add the sauted mixture in a mixing bowl, now add-in the spinach leaves, bread slices and all the seasonings and make a fine dough (if required some water may be added to make a smooth mixture). Stuff each portions of mixture with grated cheese. Roll and shape into patties. Heat up oil in a pan and shallow fry patties till golden brown. Take off and remove onto a clean and absorbent kitchen towel; or paper. Put spinach in cold water after boiling to retain its colour and nutritions. Previous Previous post: How to make your skin Glow?